You waited and waited for the news, yet it was still a surprise when it came in… the best kind of surprise. The new nursing job to which you’d applied decided that you were an excellent fit for their program. They were offering the works—a salary increase, extra vacation days, even moving expenses—and the potential for adventure in the new city was priceless. Only one question remained in your mind… what to do about your current job. This isn’t a rare scenario for nurses. It’s actually fairly common. With nurses in such high demand nationwide, it’s no shock that hospitals across the country are upping their game to attract new talent. And the better you do at your job, the better your chances of moving upward. But a career in nursing is also a career of relationships. The last thing you want to do is leave a job on a bad note, burning bridges behind you. The ideal situation is one where your current job is sad to see you go but respects your decision enough to help you leave. And navigating this world of professional resignation isn’t all that difficult. Know the Policies – Two weeks’ notice is probably the most common policy for employers, but every hospital and clinic is different. Check your employee handbook for information on how much notice is required, then make sure you abide by that rule. Don’t Hide Your Decision – The worst situation is when your manager finds out that you’re leaving… from someone other than you. The moment you know that you will be taking another position, you need to have a discussion with your manager or human resources. Not only does it keep you in good standing, but it gives your current employer a little more time to find your replacement. 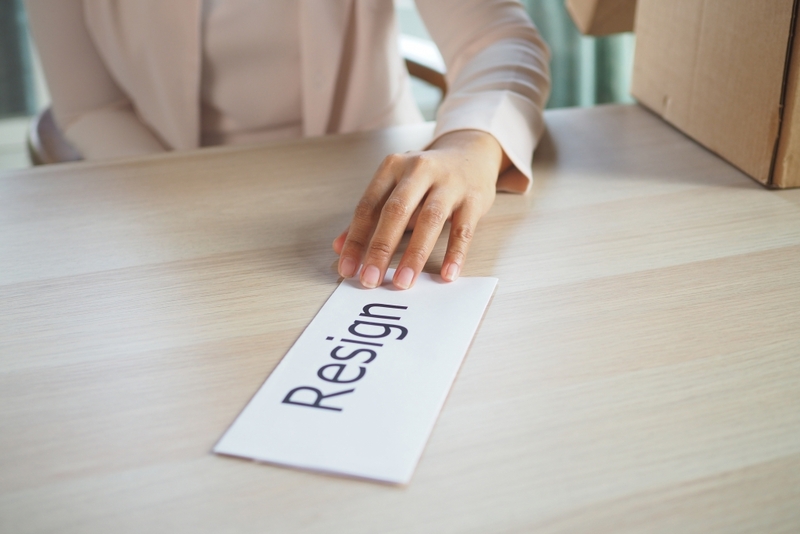 Put It in Writing – Your letter of resignation becomes part of your permanent employment record, so give it plenty of thought and polish. Keep it to one (short) page but be sure to include any applicable dates (the date of your verbal notice, your last day of work, etc) plus your reason for leaving (“I’ve accepted a position as _____ at ______”). And it doesn’t hurt to include a brief note of gratitude to your employer as well—after all, they took a chance on you. Ace the Exit Interview – Most hospital HR departments will have you give an “exit interview” to finalize all the details of your departure. Some use this as a chance to air any lingering frustrations or give a few parting shots at that co-worker who kept eating your lunch but resist the urge to do this. Be courteous, be constructive, be professional, and frame everything from the perspective of wanting to leave your former hospital in better shape than you found it. Don’t Phone in the Final Weeks – Work just as hard in your final weeks as you did in your first week… harder, if possible. This has two benefits—first, it helps alleviate any lingering guilt you might have about leaving, and second, it shows your managers and co-workers that you really did appreciate the job. Remember, there’s no telling what changes life has in store for you. You may be leaving for a better nursing job now, but who knows? Maybe an even better position will bring you back one day. And the way you leave now plays a huge part in how you’ll be received then.